This weeks edition will feature results All Japan’s Champion Carnival and NOAH’s Global Tag League, as well as results and news from the Japanese promotions that have travelled to the states for Wrestlemania weekend, as well as the usual results and news from those that stayed at home. Big Japan Pro Wrestling: Pro Wrestling FREEDOM’s Takashi Sasaki returned to Big Japan for the first time in 6 years at Death Rules 17, teaming with Ryuji Ito to beat Masaya Takahashi & Takayuki Ueki. Semi-Finals of Ikkitousen ~ Death Match Survivor ~ will take place on Day 1 of Endless Survivor 13.04. 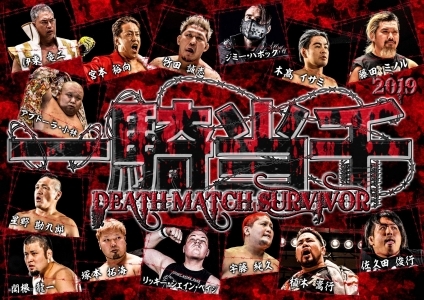 The final will take place on Day 2 the following day, as well as the conclusion to the 8 man number 1 contender tournament to Daisuke Sekimoto’s World Strong Heavyweight Championship. Dramatic Dream Team: DDT Is Coming To America show featured the Ironman Heavymetalweight change hands numerous times with Danshoku Dieno finishing the show as champion. Daisuke Sasaki defeated Konosuke Takeshita for the KO-D Openweight Championship, only for DAMNATION stablemate Endo to cash in his Right to Challenge and win the Openweight Championship from Sasaki. Yoshihiko is the current Ironman Heavymetalweight Champion following a rumble on Joey Ryan’s show. New Japan Pro Wrestling: Former New Japan wrestler KUSHIDA has signed with WWE and will be on the NXT brand. Numerous title changes at MSG as Jeff Cobb beat Will Ospreay for the NEVER Openweight, Dragon Lee is the new IWGP Junior Heavyweight Champion, G.O.D retained but now also hold the ROH Tag Team titles, Kota Ibushi beat Naito for the IWGP Intercontinental Championship and Kazuchika Okada defeated Jay White for the IWGP Heavyweight Championship. Stardom: WWRS held American Dream 2019 in the Big Apple on the 05.04, featured 2 title matches and an elimination tag featuring STARS vs Oedo Tai. Hazuki retained the High Speed title against Dust, and Momo Watanabe retained the Wonder of Stardom against stablemate Utami Hayashishita. Wrestle-1: Unfortunate news from Cherry Blossom tour from Korakuen, Yamamura suffered a neck injury during the tag team title match. Shuji Kondo is the number 1 contender for the W-1 Championship. With thanks to purolove.com and CageMatch, as well as Big Japan’s official website.